Overview: Spindrift has 3, upmarket, self catering units. We are only 1 min walk to a lovely beach yet uniquely situated in a secluded, subtropical garden surrounded by indigenous forest which is fulll of bird life. Overview: Year round warm coastal climate, a dip in the ever inviting Indian Ocean makes SEA SIDE VILLA the ideal self catering getaway. Two levels which have 7 bedrooms, 4 en-suites, 2 guest toilets, 3 large lounges, 3 dining areas. Full fitted kitchens, a Laundry with washer and Drier. DSTV facilities available on request. Relax on covered balconies and take in the sight of dolphins, whales, bird life and sounds of the sea meters away. Long walks on un-spoilt golden sandy beaches / short walks to the restaurants. Golf and horse riding a drive away. 5 min drive to Sun International Sibaya Casino and King Shaka International Airport. Overview: UMDLOTI is situated 25 km north of Durban along the warm Indian Ocean. 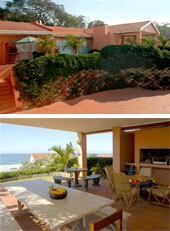 Die Strandhuis has a garden, is 100m from the beach with full sea view and has a 3-star grading. DIE STRANDHUIS has 3 separate types of accommodation, all are serviced daily except Sundays and public holidays. All the accommodation has fan ventilation, M-Net, all Sports Channels, SABC 1, 2, 3 and E-TV. Safe parking. 1. The HOUSE: min 4, max 7 people; sea view. For privacy let only to one family or a group that knows each other. 2. The EMBUIA: choice of 1 or 2 rooms; sleeps 2 or 4; sea view. Ideal for a family. 3. The ROSEWOOD: bachelor unit; sleeps 2; sea view.